Travel on Indian Railways can be daunting and confusing for the uninitiated and inexperienced. The reservation process is not straightforward, and there are many abbreviations and classes of travel. The answers to these essential FAQs will help make it easier for you. What's the Advance Reservation Period? This is how far in advance tickets may be booked. Effective from April 1, 2015, it was increased from 60 to 120 days. However, the increase doesn't apply to certain express trains, such as the Super Fast Taj Express, which have shorter advance reservation periods. The advance reservation period for foreign tourists is 365 days. However, this only applies to 1AC, 2AC and Executive classes of travel in mail express trains and Rajdhani, Shatabdi, Gatimaan and Tejas trains. The facility is not available for travel in 3AC or Sleeper classes. Your account must have a verified international cellphone number. Indian Railways requires reservations on long-distance trains for all classes of accommodations except second class. Online bookings can be carried out via the IRCTC Online Passenger Reservation website. However, travel portals such as Cleartrip.com, Makemytrip.com,​ and Yatra.com also offer online train bookings. These websites are much more user-friendly but they do levy a service charge. Do note that it's only possible to buy six tickets per month from one user ID online. Can Foreigners Make Online Reservations? Yes. As of May 2016, foreign tourists are able to reserve and pay for tickets on the IRCTC website using international cards. This is facilitated through Atom, a new online and mobile payments platform. However, foreigners must have an account that's been verified by Indian Railways. Previously, this involved a convoluted process including the emailing of passport details. However, foreigners can now immediately register online on the IRCTC website, using their international cell phone number and email address. An OTP (One-Time Pin) will be sent to the cell phone number for verification, and a registration fee of 100 rupees is payable. You can find out how to do it online. Cleartrip.com also accepts many international debit and credit cards. It doesn't show all trains though. How Can Foreigners Buy Tickets at the Station? Major railway stations in India have special ticketing offices, called International Tourist Bureaus/Passenger Reservation Centers, for foreigners. A list of stations with these facilities is available online. The one at New Delhi Railway Station is open 24 hours. Don't listen to anyone who tells you that it's closed or has moved. This is a common scam in India. You will need to present your passport when booking your tickets. How Can Foreigners Make Reservations Under the Foreign Tourist Quota? A special quota is set aside for foreign tourists to ensure that they're able to travel on popular trains that get booked out very quickly. Previously, tickets under this quota could only be booked in person at an International Tourist Bureau in India. However, a new policy was introduced in July 2017, which enables foreigners to make bookings under the Foreign Tourist Quota on the IRCTC website using an account with a verified international cell phone number. Such bookings can be made 365 days in advance. The price of tickets is higher than under the General Quota though. And, the Foreign Tourist Quota is only available in 1AC, 2AC, and EC. After logging onto the IRCTC website, click on the "Services" option on the left side of the menu at the top of the screen, and select "Foreign Tourist Ticket Booking". Here's more information. What are the Classes of Travel? Indian Railways has numerous classes of travel: Second Class Unreserved, Sleeper Class (SL), Three-Tier Air-Conditioned Class (3AC), Two Tier Air-Conditioned Class (2AC), First Class Air-Conditioned (1AC), Air-Conditioned Chair Car (CC), and Second Class Sitting (2S). In order to be comfortable, it's important to choose the class that's most suitable for you. What Are Tatkal Tickets and How Can they Be Booked? Under the Tatkal scheme, a certain quota of tickets is set aside for purchasing the day before travel. It's useful for when unexpected trips need to be undertaken, or where demand is heavy and it hasn't been possible to get a confirmed ticket. Tatkal tickets are available on most trains. However, extra charges are applicable, making the tickets are more costly. The charges are calculated as 10% of the basic fare for Second Class and 30% of basic fare for all other classes, subject to a minimum and a maximum. Passengers can make Tatkal bookings at railway stations that have a facility, or online (follow these steps for booking online). Bookings for travel in air-conditioned classes open at 10 a.m. the day before departure. Sleeper class bookings start from 11 a.m. Tickets sell out quickly and can be hard to get though, and the Indian Railways website is known to crash due to congestion. RAC means "Reservation Against Cancellation". This type of reservation allows you to board the train and guarantees you somewhere to sit -- but not necessarily somewhere to sleep! Berths will be allocated to RAC holders if a passenger, who has a confirmed ticket, cancels their ticket or doesn't turn up. WL means "Wait List". This facility allows you to book a ticket. However, you aren't supposed to board the train unless there are enough cancellations to at least get RAC (Reservation Against Cancellation) status. How Can I Find Out if My WL Ticket Will Be Confirmed? Got a WL ticket? Not knowing whether you'll be able to travel makes trip planning difficult. It's often hard to tell how many cancellations there will be. Plus, some trains and classes of travel have more cancellations than others. Fortunately, there are a couple of fast, free, and reliable ways of predicting the likelihood of getting a confirmed ticket. How Can I Find My Seat on the Train? Railway stations in India can be crazily chaotic, with hundreds of people going everywhere. The thought of finding your train among the melee can be daunting. Plus, waiting at the wrong end of the platform could spell disaster, particularly as the train may only remain at the station for a couple of minutes and you have a lot of luggage. But don't worry, there is a system in place! How Can I Order Food on the Train? There are a number of options for meals on Indian Railways. Many long-distance trains have pantry cars that provide food to passengers. However, unfortunately, the quality has deteriorated in recent years. The demand for better food has resulted in the startup of independent food delivery services, which have partnered with local restaurants. You can pre-order food (either by phone, online, or using an app), and the restaurant will package and deliver it to your seat. Travel Khana, Mera Food Choice, Rail Restro, and Yatra Chef are some popular options. 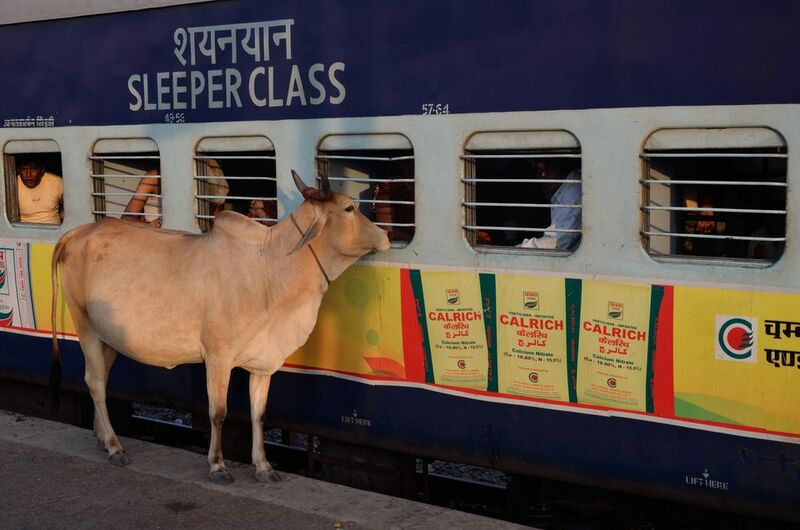 Indian Railways has begun to introduce a similar service, called e-catering. What's an Indrail Pass and How Can I Get One? Indrail passes are available to foreign tourists and provide a cost-effective way of visiting multiple destinations in India by train. Pass holders can travel as much as they like, without any restrictions over the entire Indian Railways network, within the period of validity of the pass. They are also entitled to tickets under the Foreign Tourist Quota. Passes are available for 12 hours up to 90 days. They can only be obtained through selected agents abroad in Oman, Malaysia, UK, Germany, UAE, Nepal, and Air India outlets at Kuwait, Bahrain, and Colombo. More details are available online. However, do note that according to media reports, there are plans to discontinue Indrail Passes in the near future.